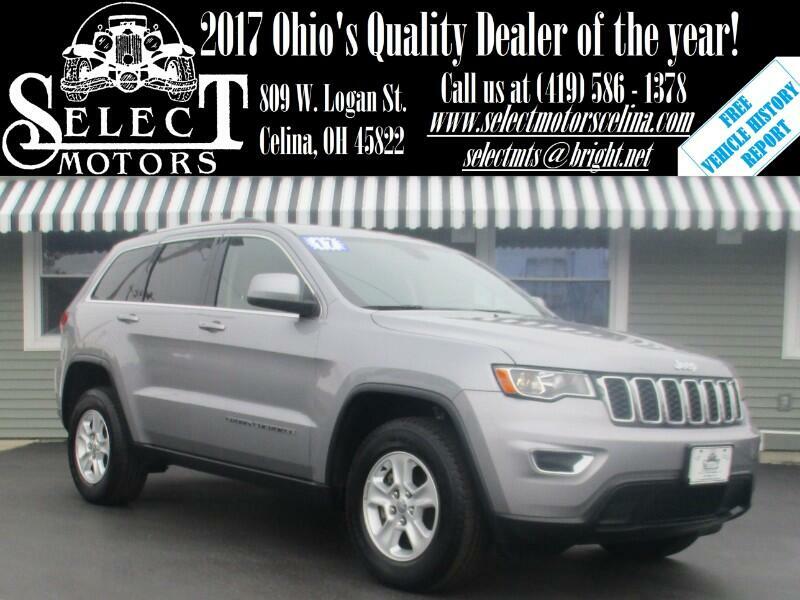 ***TXT US @: (419) 362 - 6200*** 4WD, Backup camera/sensors, dual power seats with power lumbar, automatic headlights, fog lights, heated mirrors, dual automatic climate control, power windows/locks/mirrors, keyless entry, AM/FM, SiriusXM, auxiliary and USB port, steering wheel mounted audio controls, Bluetooth, tilt and telescopic steering wheel, cruise control, information center, 17" alloy wheels. Fuel Economy: 18 city / 25 hwy. Warranties: Balance of Jeep's 3 year or 36,000 mile bumper to bumper and 5 year or 60,000 mile powertrain. In service date: 05/25/2017. Extended service contracts available. The 2017 Jeep Grand Cherokee is a five-passenger midsize SUV that comes in five trim levels: Laredo, Limited, Trailhawk, Overland and Summit. Each is available with rear-wheel drive (2WD) or four-wheel drive (4WD), except the Trailhawk, which is 4WD-only. One of our favorite things about the 2017 Jeep Grand Cherokee is that it feels relatively plush whatever trim level you choose. Certain desirable upgrades are offered only on higher trims, however, including the 8.4-inch touchscreen and the optional diesel V6 and gasoline V8 engines. The base Laredo comes fairly well-equipped, including a 3.6-liter V6 engine (295 horsepower, 260 pound-feet of torque) with an eight-speed automatic transmission, 17-inch alloy wheels, automatic headlights, foglights, heated mirrors, a rearview camera, rear parking sensors, keyless ignition and entry, dual-zone automatic climate control, a leather-wrapped tilt-and-telescoping steering wheel, Bluetooth, and a six-speaker sound system with a 5-inch touchscreen, a USB port and an auxiliary audio jack. If you're looking for a few more creature comforts (or if you just need heated seats for cold winter commutes), then check out the Limited trim level. On Limited and above, you can go with the standard V6 or you can opt for one of two more capable motors. The first is a 5.7-liter V8 (360 hp, 390 lb-ft), and the second is a turbocharged 3.0-liter diesel V6 (240 hp, 420 lb-ft). An eight-speed automatic transmission is standard for both. Other standard equipment on the Limited includes 18-inch wheels, additional chrome exterior trim, remote start, an auto-dimming driver-side and rearview mirror, a power liftgate, a 115-volt power outlet, satellite radio, a heated steering wheel, heated front and rear seats, leather upholstery, eight-way power front seats (with four-way power lumbar adjustment), driver-seat memory settings and an additional USB charging port.